HPB Presents: holidays | Light Your Nails! I am joining Hobby Polish Bloggers monthly linkup again today. Theme is holidays or winter and I obviously went for something Christmassy. 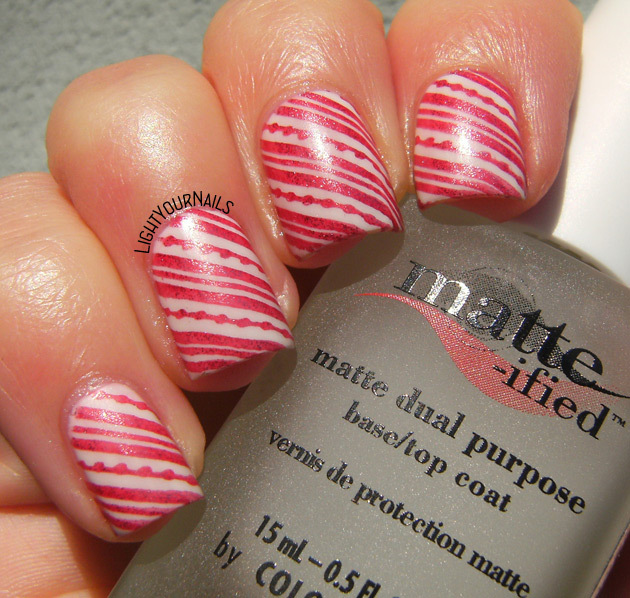 Candy canes inspired I guess! My base is again my favourite white at the moment i.e. Astra Gel Expert Effect in no. 02 Neige. I stamped over it with a red foil and plate m65. I sealed everything with Color Club Matte-ified. Oggi mi unisco al gruppo Hobby Polish Blogger per la manicure mensile a tema, che ovviamente sono le vacanze o l’inverno. Io ho scelto una manicure natalizia, ispirata ancora una volta ai bastoncini di zucchero. La base della mia nail art è sempre il mio smalto bianco preferito del momento, ovvero l’Astra Expert Gel Effect n. Neige. Ci ho stampato sopra in rosso col dischetto m65. Infine ho sigillato col top coat Color Club Matte-ified. I love these nails, they are actually a re-do of a mani I did ages ago. I hope you agree with me, do you like it? Adoro questa manicure, che poi è un remake di una nail art già postata qualche anno fa. Spero che sarete d’accordo con me, vi piace? Very eye catching and pretty! I like it, very well done and cute. Wonderful pattern. Love the mani! 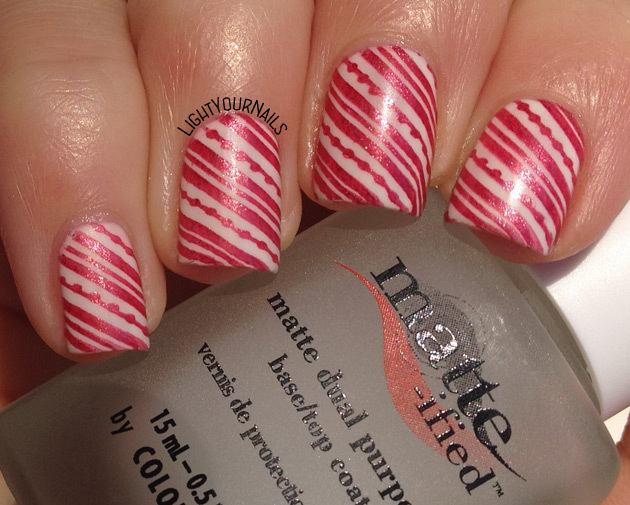 Candy Cane nails are always a good thing! I love it! It's such a happy manicure! Ooh this is really nice! I love that it isn't too "in your face" pepperminty! This is gorgeous! I love the red you used for the stamping! This is beautiful! That matte tc you use seems great! Thank you! It's kinda rubbery rather than matte but I like it, too! So nicely done! Looks gorgeous! I adore this look! Simple but very pretty! This is gorgeous and the matte top coat on it really makes it pop! Fun design!